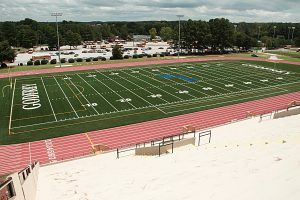 Buck Godfrey Stadium hosting key Region 4 middle school football contests at 10:00 am and 11:30 am on Saturday. Five weeks into the 2018 DeKalb County middle school football season four teams are undefeated with two weeks to go in the season. Stephenson (5-0), Bethune (4-0), Lithonia (4-0) and Henderson (4-0) have unblemished records as the race to the Trail to the Title playoffs gets serious. Bethune improved to 4-0 overall and 2-0 in the Region 4 standings with a 14-12 win over Cedar Grove last Saturday. Isaiah Logan threw for 260 yards and two touchdowns on 7 of 15 passing to lead the Lions in the win. Ventrillo Dunlap had 85 yards receiving and a touchdown and Jamari Randell added 70 yards receiving and a touchdown. Josh Peterson led the defense with five tackles while Jeremiah Curtis added four to go with three from Dunlap and Letrelle Richardson. Jamari Randell had two tackles and an interception. The win sets up a big Region 4 matchup with Chapel Hill (2-2, 1-1) on Saturday at 10:00 am at Godfrey Stadium. Chapel Hill needs a win to keep its playoffs hopes alive. Bethune could all but secure the region title and No. 1 seed with a victory. Aveon Jackson connected with Malachi Jackson for two touchdown passes to lead McNair (4-1, 2-1) to a 28-8 Region 4 win over Columbia. Kadarius Bailey and Joseph Seay each added a rushing touchdown for the Mustangs. Kharmani Patterson led the defense with four tackles for a loss and Zykeith Green added two tackles for the loss. The win puts McNair one win away from returning to the Trail to the Title playoffs as they end their regular season on Saturday against Cedar Grove (2-2, 1-1) at 11:30 am at Godfrey Stadium. Cedar Grove needs a win to keep its playoff hopes alive. The Lithonia Bulldogs improved to 4-0 overall and 2-0 in the Region 3 standings with a big goal-line stand in a 6-0 victory over the Redan Raiders (3-2, 2-1). The defensive struggle featured a 10-yard touchdown run by Octavian Tennell to give Lithonia the 6-0 lead. Redan’s Jordan Walker had a 73-yard run to put the Raiders near the goal-line with an opportunity to tie or win the game. The Bulldog defense came up big making a stop just inches short of the end zone to preserve the win. The other two undefeated teams are Region 2 leader Stephenson (5-0, 3-0) who defeated Druid Hills 18-0 and Henderson (4-0, 1-0) who defeated Sequoyah (0-5, 0-3) 48-0.